The first thing Micah Jones showed me when I visited his agricultural-barn-inspired ‘long house’ nestled among the gently undulating hills of Co. Down was a mistake. Well, not a mistake as such; what Micah calls the “beginning of a story.” The small patch of slightly mismatched, out-of-course stonework is as important for Micah as the rest of this beautifully designed house is. It tells the story of a cold winter living, on-site, in a caravan with pregnant wife Elaine and their two boys Zach and Toby; late torch-lit nights laying reclaimed stone; bending planks of wood in a homemade wood steamer and enlisting friends and family to help with last-minute painting. I am reminded of Kintsukuroi the Japanese art of repairing broken pottery with gold. As a philosophy, it treats breakage and repair as part of the history of an object, rather than something to disguise. Something many architects could learn from. The result is beautiful. The open-plan first floor unfolds seamlessly transitioning through a series of living spaces and angled walls, drawing the eye towards the main living space and a fully-glazed opening, framing views of the distant Mourne mountains. Internally the cross-laminated-timber panels used to construct the first floor have been left unfinished creating a warmth and texture accented by the careful and complimentary use of colour. Doors painted green and the hand-painted tiles in the kitchen gently lift an interior that in Micah’s words could have “felt a bit like a sauna” — it doesn’t, but I can see what he means. The ground floor is more pragmatic. A well-lit white corridor connects bedrooms a store and bathroom. These are simple spaces except for the bathroom where Micah’s self-curved timber lines the walls and a stone feeding trough found on site has been converted into a sink. Externally, the house can be accessed via stairs into the kitchen area, a nice reference to the traditional farmhouses that dot the landscape. 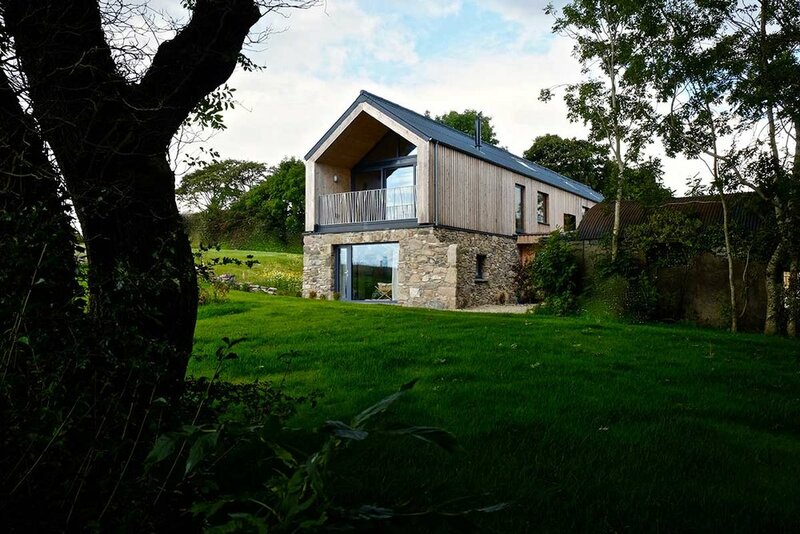 The main entrance to the house is marked by an angled timber clad shed-like structure — If you watch the episode of Grand Designs featuring this house you will learn of the inspiration that Micah draws form garden sheds. For me this is perhaps the only part of the house that I find less convincing; the proportions and angle disrupting the simplicity of a very well conceived elevation; but then it’s not my — very nice — house, and secretly I have house-envy.